There you go! It took TEPCO only 8 and a half months to say what many people have been saying at least for 8 months. The corium has long escaped the Reactor Pressure Vessel as admitted by TEPCO and the government. There are experts (like Hiroaki Koide) who have suggested the corium may have already left the Containment Vessel of Reactor 1, and TEPCO itself said back in May that Reactor 1 CV may have a 7-centimeter hole. Now the company says the corium may have eaten into the concrete floor of the CV to about 65-centimeter deep. 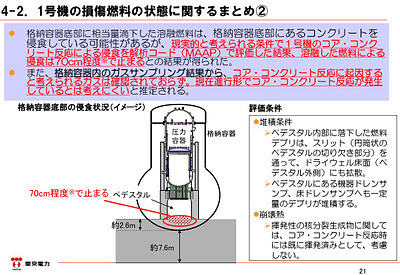 For Reactors 2 and 3, TEPCO thinks (hopes, wishes…) that a good chunk of the corium dropped from the RPV onto the CV. No mention whether the corium there is eating into the concrete or not. For Reactors 2 and 3, TEPCO also estimates that part of the fuel has dropped to the Containment Vessels, showing how severe the accident has been. In Reactors 1 thorugh 3 of Fukushima I Nuclear Power Plant, core meltdowns have occurred, and it is considered that part of the melted fuel has dropped from the RPVs to the CVs. However, the details are not yet known even after more than 8 months since the accident started. Using different methods, TEPCO and various other research institutions have been analyzing the state of the melted fuel based on the reactor temperatures and the amount of water being poured into the reactors, and the results were announced on November 30 at a workshop held by the national government. TEPCO’s result shows that, in the most severe case, all of the fuel would have melted, of which a significant portion pierced through the bottom of the Reactor Pressure Vessel and dropped onto the Containment Vessel. There is a concrete platform [pedestal] at the bottom of the Containment Vessel, which is then covered with steel plates. When the melted fuel drops to the bottom of the Containment Vessel, a core-concrete reaction takes place at a high temperature, melting the concrete. In the worst case, in Reactor 1, the melted fuel could reach 65 centimeters deep into the concrete. At the thinnest part of the concrete, it is only 37 centimeters to the outer steel plate of the Containment Vessels. This is a very severe accident. TEPCO also estimates that in the worst cases for Reactors 2 and 3, 57% and 63% of the fuel have melted, respectively, and part of the fuel dropped onto the Containment Vessels. According to TEPCO, the temperatures of the RPVs and CVs as of November 21 are all below 100 degrees Celsius, the melted fuel is cooled by the water, and the erosion into the concrete has stopped. In the workshop, the results from other research institutions were announced, and the experts discussed the conditions of the reactors and fuel based on those results. TEPCO and the national government plans to further analyze the result of the study, and determine how to remove the fuel for decommissioning the reactors.